Still grappling with how to write about Haystack and my new work, but in the meantime check out the latest Fiber Arts magazine. The front cover and corresponding article feature the work of one of my teachers at Penland, Loren Schwerd. Loren usually lives and works in Baton Rogue while teaching at Louisiana State Univeristy. Her most recent series of small sculptures was created in response to the damage done by Hurricane Katrina in 2005. After taking photos of damaged homes in New Orleans' Ninth Ward, she's paid homage to them over the last couple of years by recreating them using hair extensions discarded outside an abandoned beauty shop located in the same neighborhood. The series is aptly named Mourning Portrait. Loren's use of hair in this work most strongly references Victorian Era momento mori- intricate jewelry made from the hair of the deceased. * Not only is the wearer of the jewelry reminded of the lost individual, but also of the fragility and transience of all human life. In the same way, this work pieces together a portrait that honors the losses specific to New Orleans while allowing us to dwell on the fragility of our own lives in the face of natural disaster. The use artificial and real hair from the beauty shop has its own set of associations beyond the use of it as a physical remnant of the neighborhood. As a toddler I attended a southern rural preschool where my classmates were almost exclusively African American; the culture of hair was apparent to me even then. I proudly wore the same tiny plastic barrettes in my hair that they did, but they wore their African and agricultural ancestory on their heads in the tiny, perfect rows of braids called cornrows. These same tiny braids echoed in nearly all of the house portraits draw on and embrace the culture of the previous tenants. My personal favorites in the series are wall sculptures, 1812 Tuepelo St. (above) and Corner of Maurice and Charles, partially because the forced photographic perspective of the shuffled buildings draw attention to the tenuous hold these buildings have on maintaining existence as structure, but also because only the entrances are carefully coiffed, while the rest of the house is constructed with window screening. These houses are now ghosts of what was once a home, wonky and imperfect shanties and undeniably vacant. The persona of southern-style vernacular embodied in New Orleans architecture lies in shambles, we are unsure the soul of the neighborhood will ever recover as entire generations of families were forced into mass exodus. 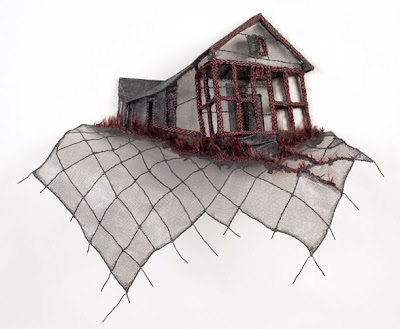 At Penland, in between classtime and helping us with our projects, Loren continued to work on one of the smaller houses in the series, carefully sewing on sections of hair bit by bit on a house-shaped framework. Fly away hair littered the floor. Watching the process up close was quite special. She's currently working on a larger house which involves handweaving panels on a loom. When hurricane Gustave hit the southeast a couple of months ago and her power was out for ten days, she was forced to use a miner's headlamp to continue working. It seems appropriate, though unfortunate, that work born of a hurricane would be continued to be accompanied by them in its making. Remember. *The use of hair as a material has been interesting for me for sometime now (read here) and last April that interest was peaked again by seeing Civil War era momento mori hair jewelry(another post for another day). Argh...I was just in town (an hour plus drive for me) and thought about stopping to see if the new Fiber Arts was out, but didn't think it was time yet! Had a wonderful time yesterday. Thank you! beautiful concept, and work. Also so well written. Love the idea of saving hair, as we evolve out of time, the hair remains.